fleet street fox: Humans seen from space, part deux. "UGH, Mondays," said chief alien research scientist Grfelft as he leaned back in his chair and scratched at his nodule. "What's the point of Mondays?" His junior colleague Bob did not look up from the viewing monitor that was trained on the blue and green planet thousands of miles below and said over his shoulder: "They're to make you appreciate Fridays more and not complain so much when you have to spend a weekend with your family." "Huh," said Grfelft, who like Bob had a large family, as they and millions like them were born from eggs laid by the Big Wang in the methane pits of their home planet, many light years away. "My family all smell of farts, and so do yours." Bob sighed and pushed the monitor away. "Are we in a grumpy mood, by any chance?" Grfelft scowled. He was always in a bad mood - he had been running this human research project from a mechanically-unsound spacecraft for nearly five centuries, after all, and had witnessed the rise and fall of empires and the extinction of species, all of which had given him a healthy loathing for humans - but today he had something even more worrying on his mind. Three of his tentacles stabbed at the keyboard in front of him and a small robot descended from the ceiling with a computer print-out in its metal claws, which it dropped into Bob's lap. Bob picked it up and read it. His eye boggled, his eyebrow was raised, and then he put it down on the desk. "Ah," he said. "Yes," said Grfelft. "The Big Wang has discovered Mondays." Mondays on Earth are spent complaining, yawning, and looking at watches and clocks. It is a day of low productivity in almost every industry and nation, and is best explained by pointing out that for the staff of Earth's newspapers Mondays are spent rewriting what was in the papers the day before, because nothing else has happened since. Where in the winter humans suffer from Seasonal Affective Disorder due to a lack of sunlight, there is a rarely-diagnosed Monday Affective Disorder due to a lack of anything interesting. On Bob and Grfelft's home planet there are no Mondays, because it has three suns and each day lasts for six weeks. There is no S.A.D. because one of the suns is always shining, and there is no M.A.D. because there are no Mondays. But the Big Wang took a close interest in the goings-on of Earth, even more than all the other planets in the universe he had sent his researchers too. There was something about humans that fascinated him, like a child with a particularly ugly scab. The message which had so worried Grfelft and Bob read: "BIG WANG INSTITUTE 7-DAY WEEK TO PROMOTE INTERSPECIES UNDERSTANDING STOP ALL PLANET NOW WORK MONDAY TO FRIDAY AND TAKE TWO DAYS OFF TO GET DRUNK AND SEE FAMILY STOP ALL GREAT EXCEPT WHOLE PLANET NOW M.A.D. STOP FAMILIES ARGUING IN METHANE PITS STOP NO WORK BEING DONE TIL WEDNESDAY STOP EVERYONE SLACKING ON FRIDAY STOP BIG WANG ALWAYS RIGHT STOP BIG WANG NOT CHANGING SEVEN DAY WEEK STOP BIG WANG NEEDS CURE FOR M.A.D. IMMEDIATELY OR WILL SWITCH OFF YOUR LIFE SUPPORT SYSTEMS STOP PS HOW IS LIZ JONES STOP." Bob and Grfelft looked at each other. "What the f*** are we going to do?" asked Grfelft, putting his head in his tentacles. Bob cleared the desk and turned the viewing monitor back on. "Well, don't despair. There must be something we can tell him to cheer him up, that would fix the M.A.D. Right, America - oh, well turns out they likened Osama bin Laden to a Sesame Street character and lied about how and why he was killed. It wasn't a kill mission at all, so that's better, yes?" He looked up hopefully. Grfelft shook his head. Bob turned back to the monitor. "Something more positive, then. Um, well, the idiot running Greece has resigned and it means Europe might get to keep the Euro?" Grfelft snorted. "How is that positive? Whole thing just leads to more Nick Clegg." "They've been saying that for ages. Besides, he's crazy. Speaking of which, how is Liz Jones since you got her in for that rebuild?" Bob shifted uncomfortably in his seat. "Ah, yes. Well it seems she's been stealing sperm." Grfelft shrugged. "So? She's only following orders." Bob winced. "Yes, but she TOLD them she was doing it." "WHAAAAAAAAAT? If she keeps malfunctioning like that they'll take a closer look and find her battery pack! Bloody hell, Bob, what did you do? Get her back up here, I'll fix her myself. Honestly." Bob shamefacedly sent the Jonesdrone whistling from the aft tubes to collect the erratic remote device and after a few moments' silence cleared his throat. 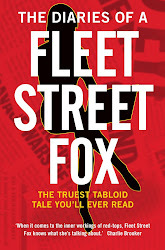 "If you want something cheery, we could always look at www.fleetstreetfox.com, she quite often does stuff on Mondays that..."
Grfelft rolled his eye. "Don't be ridiculous! The Big Wang wants a proper report! Give me the headlines, I'll pick something." "Well, they've got to seven billion people, China's lecturing Europe on workers' rights, fireworks seem to have contributed to a massive motorway accident, war, famine, Kate and Wills are about to spend millions of other people's money on their house, Nancy's off Strictly, Downton's finished, X Factor's f***ed and I'm A Celebrity hasn't started yet," said Bob. "It's all looking a bit grim down there, if I'm honest." "How about Gaga? She's normally good for a laugh." "Oh, just another silly outfit. She's taking herself a bit seriously if you ask me." Grfelft threw his pen down. "Look, this is just not good enough! Our home planet is in the grip of a dreadful human malaise and unless we can fix it the Big Wang will kill us! Actually kill us! I can't believe that on a planet of such infinite variety that doesn't have a single methane pit to deal with we can't find something to lighten the mood! Make it work or I'll tell the Big Wang Mondays are your fault!" Bob yelped, and in desperation switched the viewing scope to the other hemisphere. 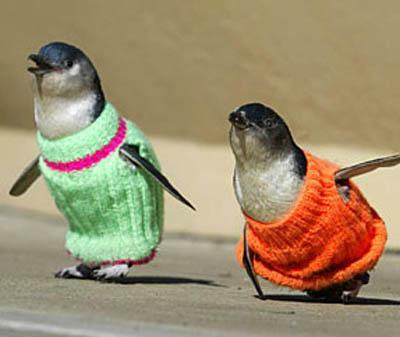 "Oh, well, how about penguins in hand-knitted pullovers?" "Yes, apparently there's been a massive oil spill in New Zealand and in order to save the afflicted penguins from being poisoned by cleaning their own feathers or dying from exposure people around the world are sending knitted penguin jumpers to help. They've sent so many they've run out of penguins to wear them." "No, look, there's pictures. There's even a knitting pattern." "That's inspired. Send all that to the Big Wang, and chuck in the video of that latest David Attenborough documentary, that ought to sort everything out. Got to hand it to them, I hate humans - they're nasty, vicious, mean, cheating, lying killers - but they do the nicest things for animals. It's weird, when you think about it." "But what about the dodos?" asked Bob. "Whatever you do," said Grfelft. "Don't mention the dodos."